EcoAnalytics provides rich, comprehensive opinion research data to inform public debate and strengthen the work of organizations and agencies devoted to environmental protection. In its first two years, July 2016-June 2018, Partners have conducted two major national surveys annually, with representative samples of 1,200 and 3,000 Canadians, including strong regional sub-samples. The Climate of Change survey (40 questions, fielded most recently in October 2018) focuses on pressing climate and energy issues. See below for details. Our Panoramic Survey (50 substantive questions, fielded in May 2017 and 2018) has shed light on Canadians' opinions, and knowledge about, a broad range of other topical issues: transitioning to renewable energy, conservation, parks and endangered species, toxics, environmental regulations, oil pipelines etc. Each year, these are developed and analyzed by Partners and a distinguished team of researchers led by Université de Montréal Associate Professor of Political Science Erick Lachapelle and Dr. Louise Comeau (Iris Communications). A strong majority of Canadians support specific government actions to cut global warming pollution by boosting energy-efficient vehicles and products and developing more clean energy, according to the EcoAnalytics Climate of Change survey conducted by researchers at the Université de Montréal. The representative national poll of 1,200 Canadians, conducted Oct. 5-Oct.18, 2016, shows 73% want their governments to do more to limit further climate change from happening. Specifically, a strong majority want governments at all levels to put less emphasis on fossil fuels such as coal (73% want less emphasis) and oil (60% want less emphasis) and more emphasis on developing clean energy, such as solar (85% want more emphasis) and wind (71% want more emphasis). 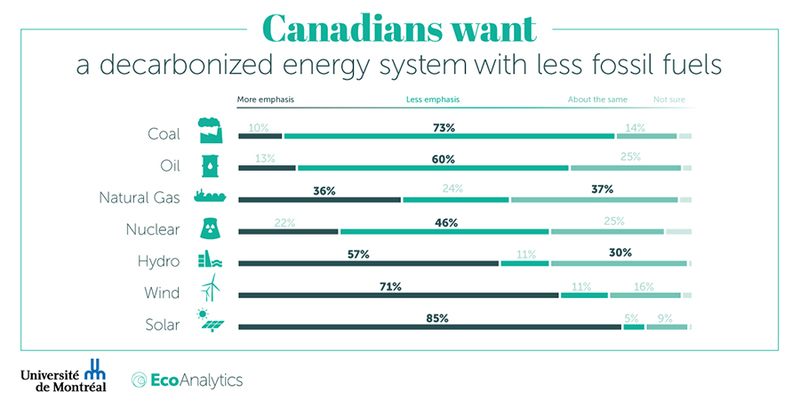 Canadians believe a shift toward clean energy would bring a broad range of benefits, including cleaner air and improved public health (38% of respondents), reduced carbon pollution (20%), increased technological innovation (17%), enhanced energy security and stable energy prices (11%) and new green jobs (9%). For the full results and analysis of the survey (cross-tabulations, analytical report and advance webinar with market segmentation), apply to become a Partner of EcoAnalytics at Join Us. The aim of the Climate of Change survey is to understand on a deeper level Canadian attitudes towards climate change. It builds on four similar surveys by Dr. Lachapelle of Canadian public opinion about climate change and transitioning to clean energy since 2011. The results reveal changes in Canadians core beliefs, attitudes and risk perceptions related to climate change. It examines attitudes about possible solutions: who is responsible for action; what actions are most appropriate; willingness to accept responsibility and bear costs, etc. EcoAnalytics Partners have access to the full results, and further analysis, of the Climate of Change survey, and the Panoramic Survey. The aim of this second EcoAnalytics survey is to provide a fine-grained image of Canadians’ views about a broad-range of environmental issues. To generate the required data, it will meet the gold standard for opinion research, posing up to 50 questions to 2,500 Canadians in up to six regions—Atlantic, Québec, Ontario, Prairies, Alberta and British Columbia—via cell phone and land-line listings. The results will then allow for meaningful comparisons across regions and among diverse demographic groups nationwide—critical information for campaigners, program managers, businesses and governments alike. An entire section of the survey will be reserved for region-specific questions, allowing Partners to zoom in on attitudes about issues that are salient in different parts of Canada. Respondents will answer questions divided into four modules. Module 1 will allow researchers to understand the demographic characteristics and shifting attitudes and values of respondents and track responses to a core battery of questions over time. Questions might include: What is the most important (environmental) problem facing Canadians? ; How informed are you regarding the state of Canada’s environment? How connected do you feel to the environment? ; and Who is responsible for particular environmental problems and solutions? Module 2, by contrast, will focus on a specific environmental theme as selected by EcoAnalytics Partners. In 2017, this will be marine, land and species conservation, with about ten questions: for example, Is the federal government doing enough to honour its international commitments to establish marine protected areas? ; Are national parks being well managed? ; and How well is Canada protecting endangered species? Modules 3 and 4 will home in on a variety of other topical issues. The third module will pose questions that vary from survey to survey for respondents from all regions, and test different types of language and ways of framing issues. The fourth module will include questions tailored specifically for respondents in each region. British Columbians might be asked about Pacific salmon fisheries; Quebecers about toxics in the St. Lawrence River; Maritimers about tidal power in the Bay of Fundy. EcoAnalytics generates "shared intelligence": the results of all modules are shared with Partners via detailed cross-tabulations, as well as a final analytical report and advanced webinar. Subscribers will receive a summary report and basic webinar.